Shiv Yog Krishi is the vedic science of growing abundant, zero-expense, amaritasya organic food which has the cosmic energy of the universe. 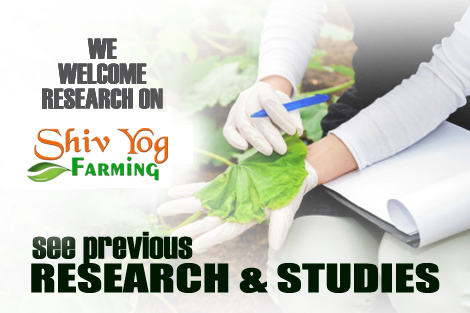 Farmers who have applied this on their fields have multiplied their output 2-8 times, progressed towards a handsome bank balance, soil tests have reported enhanced fertility, water table has improved among many other farm-related, finance-related and personal health related benefits accruing to the farmers. NEWS MEDIA RECOGNISES SHIV YOG COSMIC FARMING AS THE ANSWER TO ALL ILLS PLAGUING MODERN AGRICULTURE The struggle to find a permanent solution to the troubles in farming and food has proved to be an uphill and cumbersome task. The arrival of Shiv Yog Cosmic Revolution in Farming, has however transformed farmer fortunes, organic cultivation and chemical free food as news media found out when they visited Shiv Yog Sadhna shivir in Gurgaon recently. SIZEABLE COVERAGE TO THE REVOLUTIONARY AND GAME CHANGING SHIV YOG COSMIC FARMING ON NATIONAL PUBLIC BROADCASTER SIGNALS THE EMERGENCE & ACCEPTABILITY OF THE ROLE OF CONSCIOUSNESS IN CONTROLLING ALL FACTORS ASSOCIATED WITH CROP OUTPUT AND FARM YIELD. THE TWO OBJECTIVES OF SHIV YOG MISSION 1) Making Agriculture a holistic process, fruitful for producer and consumer 2) Making healthy nations by empowering people to be healthy. All of this through Shiv Yog Cosmic Healing, the precious and invaluable energy of penance of His Holiness Dr Avdhoot Shivanand.